Beginning anywhere is an approach I understand, one that probably every writer instinctively understands, but it still feels like an act of daring. Get something down, anything, don’t worry where it ultimately belongs, or if it belongs, sort it out later. And yet, wanting perfection, I want to get it right from the beginning. Sometimes I imagine I’ve done it right. Imagining I have a flawless opening when I have never had a flawless opening is both ego and laziness. In reality, if I think I have the perfect beginning, I know it will be replaced in some later draft. My actual beginning will be somewhere in the middle, or perhaps the end itself, or in words not yet dreamt. The only truth here is that I won’t find it at all if I don’t begin. Anywhere. But beginning is hard. Beginning anything is hard. Except, perhaps, beginning a love affair. That doesn’t seem hard, but that’s because the only thing riding on it is your life, not the start of a story. That beginning comes out of feeling, not thinking. The best writing also comes out of not thinking, but to get to the place where you do not think, you must consciously begin. In writing, you can see how hard beginning is. You are reluctant to begin. You clean the house, wash the dog, drive to Tuscaloosa. When there’s nothing left to do, you sit down to write. You begin. This is not how you begin a new love affair. It is, perhaps, not fair, or wise, to compare writing and love affairs, although they have in common their profound intensity. I suppose some people have love affairs with their writing. I am not one of them. But what about beginnings in a new job, a new school, learning a new skill. Skiing, for instance, is much harder for a beginner than for an expert, even though a beginner is on baby slopes and experts are on killer slopes. I imagine that hang gliding is harder in the beginning, but it isn’t something that’s ever actually interested me. There are other things that don’t interest me – like becoming a surgeon or a nun, but I’m certain they are just as hard in the beginning as anything else. For a writer, though, beginnings, like endings, are arbitrary, in some eye of the beholder, personal, always invented. They come out of nowhere. Nothing existed before the beginning. There is nothing fixed in the Universe that says – this is the beginning. Beginnings are no more absolute than rain. I haven’t written a new website article for the last few months. Yesterday, sitting at my desk, staring at the card with John Cage’s words, I began thinking about the beginnings of everything. 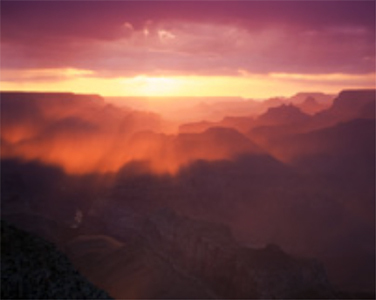 Writing, skiing, climbing, marriage, moving, Thanksgiving dinner, storms, diabolical storms, friendship, rivers. 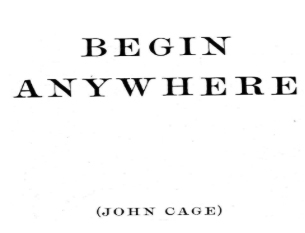 Because I’ve always had trouble beginning, I’ve collected a fair number of quotes about beginning, although Cage’s is the only one currently on my desk. But I’m aware that each time I’ve come across one, the timing of it made it seem a personal message. (From whom . . .?) This seems a time to visit a few of them. There are more. This is just a beginning.